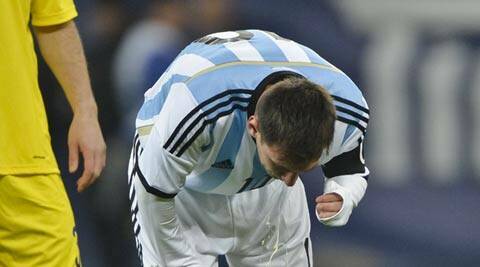 Messi was sick during Argentina’s 0-0 draw and he said it was something that had occurred several times at Barca. Recent episodes of vomiting suffered by Barcelona forward Lionel Messi are “not normal” but they do not affect his performance and there is no cause for alarm, coach Gerardo Martino said on Friday. Messi was sick during Argentina’s 0-0 draw with Romania on Wednesday and the four-times World Player of the Year said it was something that had occurred several times at Barca but was nothing to be concerned about. “It happens to him regularly and he has even gone to see specialists at certain times,” Martino said ahead of Barca’s La Liga game at Real Valladolid on Saturday. “They haven’t solved the problem but it isn’t a cause for concern. It doesn’t affect him at all in terms of doing his job,” he added. Barca, chasing a fifth title in six years, can pull two points clear of Real Madrid at the top with a win at Valladolid, who are battling relegation down in 18th. Real are at home to eighth-placed Levante on Sunday, while Atletico Madrid, three points off the top in third, play at Celta Vigo, who are 11th, on Saturday. Martino has Gerard Pique back after the Spain defender was declared fit. He missed the world and European champions’ 1-0 win at home to Italy on Wednesday due to a minor calf problem. With an eye on Barca’s packed calendar in March, including Wednesday’s Champions League last 16, second leg against Manchester City, Martino said he had decided to rest left back Jordi Alba for the Valladolid trip. Alba was out for more than two months with a hamstring injury before Christmas and was briefly sidelined by a similar thigh problem last month. Barca lead City 2-0 from the first leg.